I'm a big fan of Counter Culture Coffee's message of "Any Coffee, Any Brew", which basically supports the idea that you can brew a delicious cup of whatever kind of coffee, however you want, depending on your personal preferences or mood. My own home is filled with a crazy amount of brewing equipment that I've acquired over the years, though I almost always find myself either reaching for a French press or taking advantage of the ease of an auto drip brewer. 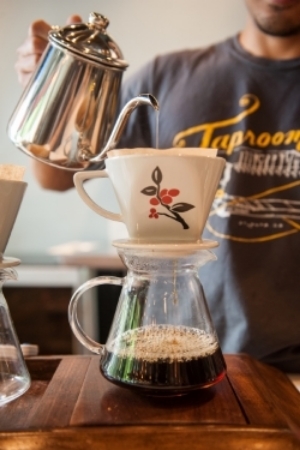 At Taproom, we brew coffee several different ways. One of our favorites is a simple manual pourover method, using ceramic drip cones. Now, we don't claim that this is the best method, or that it magically produces perfect coffee in any way. What this method allows us to do is brew a great cup of drip coffee, just for you. You choose whatever coffee that sounds best to you from the list, and we spend a few minutes going through the brewing ritual. If you want to just stand there, quietly observing the circular motions and the slow drip as the glass beaker fills with your personal cup of joe, that's fine by us. If you want to chat about your day, or discuss the science behind the brew process, or talk about Gurley's return, that's totally cool too. A lot of coffee brewing methods have this time and ritual built into them, giving you and others the chance to chat and connect. That's one of my favorite parts about coffee: the ritual. But even if you only see it as a means to an end, learning different ways to brew coffee can be a lot of fun. You find out that a bit of curiosity and personal education can result in you having more control over exactly how your daily cup of coffee tastes. In the spirit of embracing all the different kinds of brew methods, over time we're going to be teaching our customers various methods of brewing coffee at home, through hands-on tutorials we're calling "Brew & Brew". The basic idea for this monthly event is that we want to chat about coffee brewing and share our knowledge and resources with others, but a lot of people only have free time in the evenings, when they don't want to drink a bunch of coffee. Our solution: Brew the coffee, but drink beer instead. Our first free Brew & Brew event is tomorrow night (November 13th), at 7PM. We're starting off teaching folks about the same manual pourover method we use at Taproom - the Bonmac drip cone - but other months we'll tackle different brewing devices. I hope that as we go through this series, you'll have more tools under your coffee belt, and you'll find your favorite go-to brewing method!